Why go out shopping for expensive furniture and organizing products when so often we already have the perfect solution at home?! This wicker cabinet held a few kitchen odds and ends - mostly some seasonal table linens that found a new home in the kitchen cabinetry. 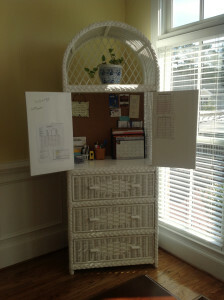 We emptied out the piece and converted it into an "occasional" home office. Like an occasional chair that fills wall space until it's called upon to serve as extra seating for company, the cabinet appears decorative most of the time but easily opens up into a functional, standing office. Family archive files are stored in Husband's home office along with his business papers; Wife's occasional office holds just the daily necessities for managing household paperwork and kids' schedules. Cork board backing displays invitations and coupons, and laminating paper turned the inside of the doors into wet-erase board for notes. When it's not being used, my client's laptop sits neatly in the cabinet. Files and office supplies are stored in the drawers below. Now my client's supplies are located centrally in her home, where she can work side by side with her kids at the kitchen table, rather than hidden away in a "satellite" office away from the action. And when it's time for dinner, the clutter magically disappears into her lovely corner cabinet.